Guide to resources for locating government information. Decisions released by the Court since 1990. 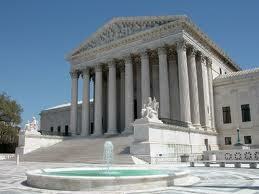 Over 300 of the Supreme Court's most important decisions since its inception. Official record of the rulings, orders, case tables, and other proceedings of the U.S. Supreme Court from 1754 to present. Searchable archive of all public sessions recorded in the Supreme Court since 1955. Provides cases from the U.S. Supreme Court, Federal and State courts including U.S. Courts of Appeals, U.S. District Courts, and Federal Military Courts. Provides case and docket information from the federal appellate, district and bankruptcy courts. Case locator available. Registration and fee payment are required. Free access to a limited number of cases in the Federal and State courts including U.S. Supreme Court Cases and Opinions from 1791 to present. Access published opinions of US state appellate and supreme court cases since 1950, US federal district, appellate, tax and bankruptcy courts since 1923 and US Supreme Court cases since 1791. Also, includes citations for cases cited by indexed opinions or journal articles.